AKYAPAK, as a leader of its sector, shows its technology in steel construction drilling lines and moves it from Turkey to the World. AKYAPAK, created AKDRILL brand in this sector, manufactures CNC drilling machine series with servo motor driven in the name of ADM for steel construction masts. AKDRILL ADM Drilling Machines provide high quality solutions in manufacturing of steel construction, bridge construction, shipyards and various fields of construction sector. ADM series have the drilling capacity of H, I, and U profiles or angles with 10-40 mm | 3/8-1-9/16” standard diameters or more. ADM Drilling Lines consist of one, two or three independent spindles. 1 ADM model which has one spindle, has the capacity of drilling the profile from three sides with right angle and by rotating +90/-90 degree. 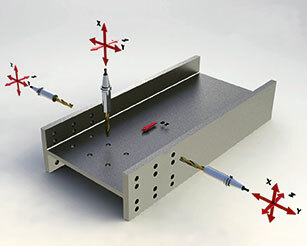 3ADM model, which has three spindles, has the capacity of drilling the profile from three sides independently, marking and tool changing at the same time. 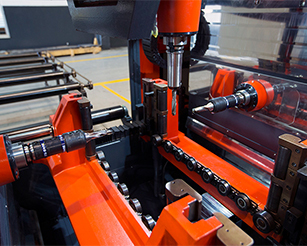 Resetting the equipment to zero and setting to the next drilling position are performed automatically by CNC. tADM Drilling Lines, manufacturing with first class equipment as Mitsubishi and Siemens, become prominent with quality and reliability with Akyapak’s strong after sales support, as well. Through 3 independent servo spindle units on 3 ADM model, the profile can be drilled from 3 sides at the same time. There are four tool capacity automatic tool changing system station for each spindle. Beams can be drilled without driving them throughout the beams’ length of 500 mm. | 20” For instance; if the holes’ diameters are 10 mm | 3/8” and the distances between each holes are 40 mm, | 1,57” the spindle is able to drill 12 holes without moving the beam and that means you may save plenty of time within the operation. And that means very big time saving. Also there is one more advantage of 3ADM system which makes you eligible to make scribing marking on 3 surfaces (Optional). 3-axis marking is also available as an option. Firstly, material to drill (profile, box profile, angle) is placed on infeed conveyor. The workpiece, being held with handle claw of driving unit, is driven into the drilling machine and the position of the piece is set to zero by laser light. Drilled workpiece is driven to the angled bandsaw (optional) with handle claw of driving unit. Sawing can be performed in desired lenght and angle (-45/+60”). Sawed rolls of material are driven to the output conveyor. Slotting capability without moving the beam in 20”.